In order to increase the number of egg chambers at stages 12-14, the flies are transferred into new culture vials 2 or 3 d before starting the procedure. Stress caused by the transfer slows down egg laying, and mature (stage 14) and nearly mature eggs (stages 12 and 13) accumulate in the ovaries. 1. Etherize flies and divide females into groups of four to six, and put in small glass vials capped with facial tissue. 2. Transfer a set of females to a Petri dish covered with paraffin. Pipet a small drop of insect-Ringer's solution to a dish near the females. 3. Pick up one female at a time by sticking a thin (no. 000) insect pin through the thorax, and transfer the female near to the drop of Ringer's solution. 4. Using a thicker insect pin (no. 0 or 1), stick the abdomen dorsally between the third and fourth segments and pull the tip of the abdomen with ovaries into the drop. Repeat this for each female in the set. 5. Using an insect pin with a small hook, transfer the tip of each abdomen (containing ovaries) to a small Petri dish containing hypotonic solution (0.075 M KCl) for 6 min (for egg chamber stages 2-12) or for 10 min (for stages 13 and 14) (see Note 1). 6. Using the hooked insect pin, transfer the tips of abdomens into a glass vial containing modified Carnoy fixative. Incubate for at least 2 h at room temperature. If necessary, ovaries can be stored in fixative for several days at 4°C. 7. Decant the fixative away and refill the vial with an equal volume of absolute ethanol. Allow the vial to stand at room temperature for 2 h. Replace the ethanol with an equal volume of 70% ethanol and keep the vial at 4°C overnight. 8. Prepare a decreasing ethanol series—50%, 30%, distilled water, and 1 N HCl at room temperature—in glass vials. Put a small plastic tube with small holes in its bottom inside the vial containing 50% ethanol. Take 5-10 abdomens at a time from 70% ethanol and transfer them to 50% ethanol inside the plastic tube. Incubate for 30 min. Using the small plastic tube, transfer the ovaries through 30% ethanol (5 min), distilled water (brief rinse), and into 1 N HCl (30 min) at room temperature. 9. For hydrolysis, incubate the ovaries in 1 N HCl at 60°C for 8 min. 10. Transfer the ovaries directly into Schiff's reagent for 3-5 min and then into distilled water (see Note 2). 11. Use the cut Pasteur pipet to transfer abdomens with ovaries and an appropriate amount of distilled water from the inner vial into a small Petri dish. 12. For preparing a slide from stages germarium to stage 12, transfer one abdomen with ovaries into a small drop of distilled water on a clean object slide. Remove all other tissue except ovaries, and if ovaries carry mature eggs, remove these too. Detach the ovarioles from each other. Remove excess water with a piece of filter paper, and pipet a small drop of 45% acetic acid next to the ovarioles (see Note 3). Use insect pins to move the acetic acid drop over the ovarioles. Wait until all the tissue is transparent, then put a cover slip (18 x 18 mm2) on the material. Inspect the slide with a phase-contrast microscope. Wait until all of the streaming under the cover slip ceases, gently press the slide between filter paper, and put the slide on dry ice. 13. For preparing a slide from stages 13 and 14, transfer one abdomen with ovaries into a small drop of distilled water on an object slide. Choose one of the ovaries (carrying the greater number of egg chambers of the desired type) and leave it in the drop while removing all other tissues from the drop. In developing eggs at these stages, the chorion is well developed and has to be removed. For this, cut the eggs in half with insect pins and keep the anterior part in its place with one of the pins. With the second pin, press the egg in an anterior to posterior direction until the yolk enveloped by vitelline membrane comes out from the chorion. Collect dechorionated anterior parts in one place inside the drop. Usually four to six eggs are prepared from one ovary. Then, remove all of the other material from the drop by wiping with an insect pin. Remove excess water around the anterior parts. Pipet a small drop of 45% acetic acid next to the anterior parts. Use insect pins to move the drop onto the anterior parts. Wait until the yolk is transparent and place a cover slip (18 x 18 mm2) in its position. Now, the slide can be inspected with phase-contrast optics. The yolk is spread evenly and the most prominent structures seen are remnants of vitelline membrane. Usually, the spindles are situated near these structures. When the streaming under the cover slip is ceased, press the slide gently between the filter paper and place it on dry ice. 14. After freezing the slide for at least 10 min, remove the cover slip with a scapel and immerse the slide in a staining jar filled with absolute ethanol for 5 min at most. Dip the slide in glacial acetic acid for 18 s (see Note 4) and air-dry for at least 20 min with a dryer. Store the slide(s) in a dust-free place (e.g., in an incubator [40°C]) at least overnight or longer (air-dried slides can be stored up to 1 yr before Giemsa staining). 15. Incubate the slides in Sorensen's phosphate buffer (pH 6.8) in a staining jar for 5 min. 16. Stain the slides with 4% Giemsa in Sorensen's phosphate buffer for 30 min, rinse briefly in distilled water, and air-dry with a cool fan for 20 min. 17. Mount the slides in Entellan using 24 x 32-mm2 cover slips. 1. Allow inseminated females to lay eggs in fresh culture bottles overnight. 2. Etherize the females and squeeze eggs out of uteri by pressing the abdomen near the uterus with thick insect pins. Repeat collecting at 1- to 2-h intervals. 3. Fix the eggs immediately for 30-60 min in modified Carnoy fixative in small glass vials at room temperature. 4. Add approximately an equal volume of absolute ethanol and allow the fixation to continue overnight at 4°C. 5. Remove the fixative-alcohol liquid and replace with absolute ethanol. Keep at room temperature for 2 h.
6. Replace the absolute ethanol with 70% ethanol and store at 4°C overnight. 7. Using a Pasteur pipet, transfer eggs into an egg basket in a small Petri dish containing 50% ethanol. Incubate for 30 min. 8. Carry the egg basket through 30% ethanol (3-5 min), distilled water (a brief wash), and into 1 N HCl for 30 min at room temperature (see Note 5). 9. Hydrolyze the eggs with 1 N HCl (8 min) and stain with Schiff's reagent for 3-5 min. Transfer the eggs in distilled water. 10. Place one egg at a time in a drop of distilled water on a clean microscope slide. Cut the egg into anterior and posterior halves with insect pins. Remove the chorion from both halves and incubate them in 45% acetic acid as described in Subheading 3.1., step 13. 11. After previewing the egg halves with a phase-contrast microscope, remove the cover slip with the dry-ice method (see Subheading 3.1., step 14). Dehydrate the slides in 99% (or 96%) ethanol for 5 min, immerse the slides in glacial acetic acid for 20 s, and air-dry with a fan for 20 min. Store the slides in a dust-free place until stained with Giemsa (see Subheading 3.1. for instructions). 1. Hypotonic treatment is essential to reveal details (i.e., the positions of bivalents and univalents), in prometaphase I and metaphase I spindles in eggs at stages 13 and 14. If the treatment is too short, all bivalents and univalents are clumped together. If the treatment is too long, chromatids become thin and threadlike making analysis of metaphase figures difficult. Usually, treatment times from 9 to 10 min give optimal results. As whole ovaries are subjected to treatment, individual eggs within ovaries receive slightly varying treatments. Thus, among eggs within an ovary, there are eggs for which the treatment time is too short. It has been claimed that hypotonic treatment activates the first meiotic spindle, inducing the onset of anaphase (7). However, we have not been able to observe the release of metaphase arrest and the onset of anaphase after treatment with 0.075 M KCl solution. On the contrary, chiasmata are seen still to be holding homologs together (see Figs. 1 and 2), evidencing a metaphase I configuration. 2. The significance of this step is not actually to stain chromosomes, but to affect especially yolk to make it spread evenly. Optimum spreading is achieved when chromatin material appears black or gray colored when inspected with phase-contrast microscopy. If chromatin material appears shiny or bluish, the staining time with Schiff's reagent must be shortened. 3. The size of the acetic acid drop is critical; a drop with a diameter of 4-5 mm gives optimal spreading. 4. After glacial acetic acid treatment for 15-18 s, Giemsa stains the yolk slightly bluish. If the treatment is prolonged, the yolk remains colorless, making the finding of metaphase figures extremely difficult. a. Transfer the eggs to 2 N HCl for 2 h, and then into distilled water. Eggs that are at early stages become transparent, whereas older eggs remain opaque. b. Cut the transparent eggs in half, remove the chorion, and make squashes in 45% acetic acid with both halves on the same slide. c. Remove the cover slip by using the dry-ice method, dehydrate the slide in a 3 : 1 mixture of ethanol and glacial acetic acid for 15 min, and air-dry with a fan for 20 min. d. For staining, hydrolyze the slide in 1 N HCl at 60°C for 8 min, treat with Schiff's reagent for 10-15 min, and rinse in distilled water, three to four changes, until the water remains colorless. e. Stain with 4% Giemsa solution as described in of Subheading 3.1., step 16. 1. Bier, K., Kunz, W., and Ribbert, D. (1967) Struktur und Funktion der Oocyten-chromosome und Nukleolen sowie der Extra-DNS während der Oogenese panoistisher und meroistischer Insekten. Chromosoma 23, 214-254. 2. Bier, K., Kunz, W., and Ribbert, D. (1967) Insect oogenesis with and without lampbrush chromosomes. Chromosomes Today 2, 107-115. 3. Grell, R. F. (1976) Distributive pairing, in The Genetics and Biology of Drosophila, (Ashburner, M. and Novitski, E., eds. ), Academic Press, London, Vol. 1a, pp.435-468. 4. Hawley, R. S. and Theurkauf, W. E. (1993) Requiem for distributive segregation: achiasmate segregation in Drosophila females. Trends Genet. 9, 310-317. 5. Hawley, R. S., Irick, H., Zitron, A. E., et al. (1993) There are two mechanisms of achiasmate segregation in Drosophila females, one of which requires heterochro-matic homology. Dev. Genet. 13, 440-467. 6. Hawley, R. S., McKim, K. S., and Arbel, T. (1993) Meiotic segregation in Droso-phila melanogaster females: molecules, mechanisms, and myths. Annu. Rev. Genet. 27, 281-317. 7. Puro, J. and Nokkala, S. (1977) Meiotic segregation of chromosomes in Droso-phila melanogaster oocytes. A cytological approach. Chromosoma 63, 273-286. 8. Theurkauf, W. E. and Hawley, R. S. (1992) Meiotic spindle assembly in Droso-phila females: behavior of nonexchange chromosomes and the effects of mutations in the nod kinesin-like protein. J. Cell Biol. 116, 1167-1180. 9. Dernburg, A. F., Sedat, J. W., and Hawley, R. S. (1996) Direct evidence of a role for heterochromatin in meiotic chromosome segregation. Cell 86, 135-146. 10. Williams, B. C., Dernburg, A. F., Puro, J., Nokkala, S., and Goldberg, M. L. (1997) The Drosophila kinesin-like protein KLP3A is required for proper behavior of male and female pronuclei at fertilization. Development 124, 2365-2376. 11. 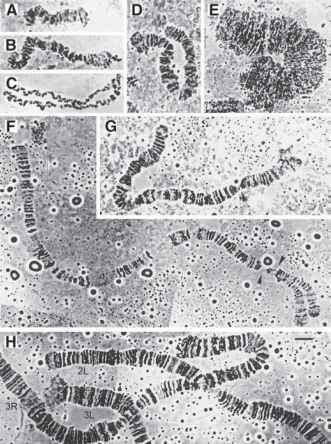 Carpenter, A. T. C. (1975) Electron microscopy of meiosis in Drosophila melanogaster females. Structure, I., arrangement, and temporal change of the syn-aptonemal complex in wild-type. Chromosoma 51, 157-182. 12. Carpenter, A. T. C. (1979) Synaptonemal complex and recombination nodules in wild-type Drosophila melanogaster females. Genetics 92, 511-541. 13. Davring, L. and Sunner, M. (1973) Female meiosis and embryonic mitosis in Drosophila melanogaster I. Meiosis and fertilization. Hereditas 73, 51-64. 14. Nokkala, S. and Puro, J. (1976) Cytological evidence for a chromocenter in Droso-phila melanogaster oocytes. Hereditas 83, 266-268. 15. Chubyin, V. L. and Chadov, B. F. (1978) The chromocenter in meiotic cells of Drosophila melanogaster females with XY-compounds. Tsitologia 29, 168-173. 16. King, R. C. (1970) Ovarian Development in Drosophila melanogaster. Academic, New York. 17. McKim, K. S., Jang, J. K., Theurkauf, W. E, and Hawley, R. S. (1993) Mechanical basis of meiotic metaphase arrest. Nature 362, 364-366. 18. McKim, K. S. and Hawley, R. S. (1995) Chromosomal control of meiotic cell division. Science 270, 1595-1601. 19. Puro, J. (1991) Differential mechanisms governing segregation of a univalent in oocytes and spermatocytes of Drosophila melanogaster. Chromosoma 100, 305-314. 20. Riparbelli, M. G. and Callaini, G. (1996) Meiotic spindle organization in fertilized Drosophila oocyte: presence of centrosomal components in the meiotic apparatus. J. Cell Sci. 109, 911-918. 21. Endow, S. A. and Komma, D. J. (1997) Spindle dynamics during meiosis in Drosophila oocytes. J. Cell Biol. 137, 1321-1336. 22. Endow, S. A. and Komma, D. J. (1998) Assembly and dynamics of an anastral : astral spindle: the meiosis II spindle of Drosophila oocytes. J. Cell Sci. 111, 24872495. 23. Tirián, L., Puro, J., Erdélyi, M., et al. (2000) The KetelD dominant-negative mutations identify maternal function of the Drosophila Importin-P gene required for cleavage nuclei formation. Genetics 156, 1901-1912.